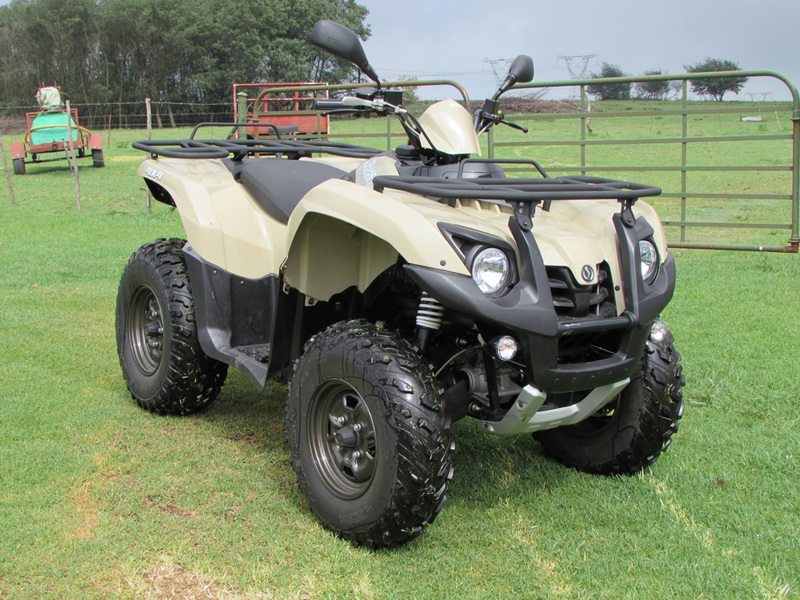 The quad market has certainly seen some ups and downs in recent years, especially in the recreational segment where sport quad sales peaked towards the end of 2007. ATV’s were still affordable back then and quickly developed into a craze, rightly so. Quad biking is an adventurous activity and something the entire family can enjoy. Unfortunately the hype decreased in due course and popularity dwindled somewhat. Utility quads however have maintained a strong presence. Their purposeful, functional design ensures that they are well suited to a working environment, not discounting leisure activities especially if the chosen riding terrain requires a bit more capability. Utility quads make for perfect, cost effective work horses and excel in the farming and mining industries, just to name a few. The SYM brand is famous for their scooter and commuter variations, also very much intended for purpose driven applications. 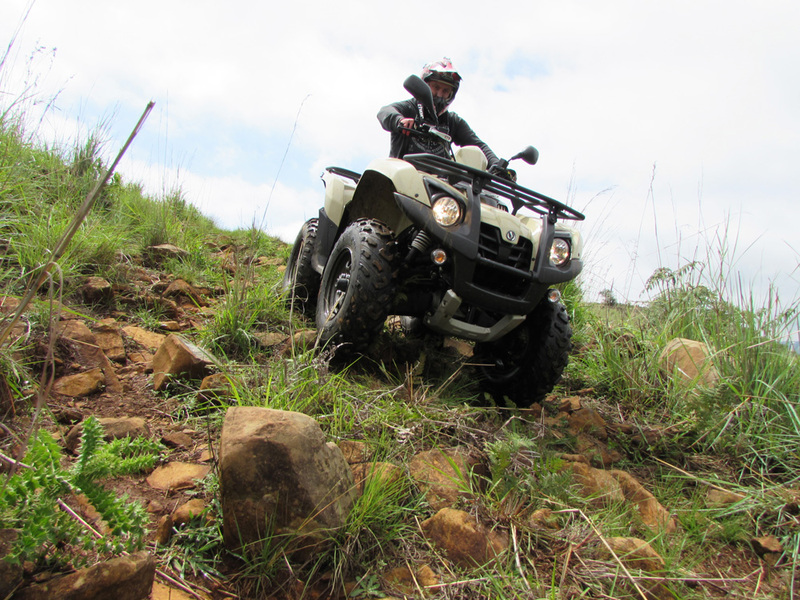 So it may come as no surprise that SYM realised the potential of utility quads and hence also offer the Mighty QuadRaider as part of their range. The SYM QuadRaider is powered by a 565cc, single, 4 stroke, water cooled motor which murmurs along effortlessly. The engine tone is somewhat subdued, doing little to disturb the peaceful surroundings of the land it serves. With maximum torque of 34.53 Nm reached at 3000 rpm one does not have to push too hard to put this competent worker to task. Notably the fuel system is carburettor, a positive when it comes to self-servicing out in the field. The QuadRaider is fully automatic offering low and high range suitable to a variety of terrains. It also has reverse and switchable 2X4 / 4X4 at the press of a button. As expected the SYM QuadRaider houses all the features available on other utility quads. These include, load racks front and rear, a tow bar mount, decent sized wheels and more than adequate ground clearance. An advantage is that the generous seat allocation allows enough room for two people. 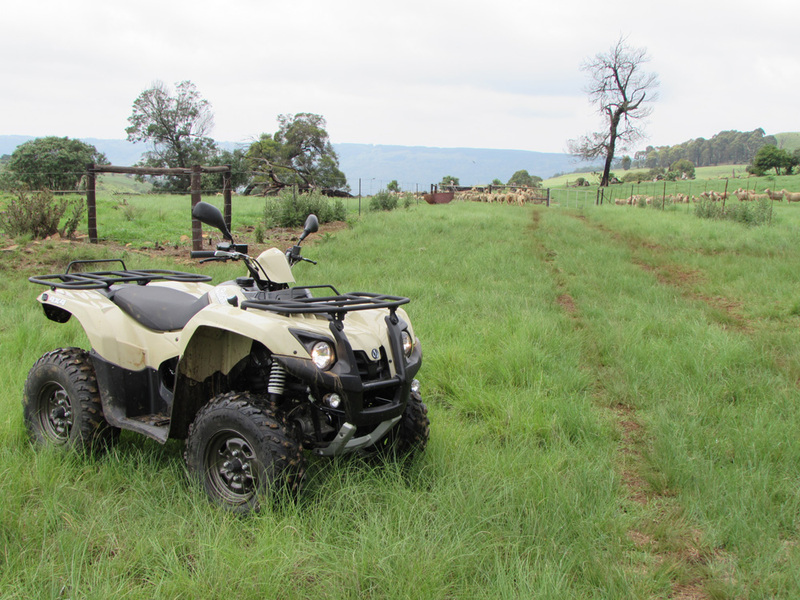 I had the pleasure of riding the Quad in what proved to be the perfect location, a cattle farm just outside Dundee in KZN. The farm offered a multitude of different riding terrains, incidentally quads are the preferred means of getting around for most farmers in the area. It was incredible to experience how easily the QuadRaider reached what many would consider inaccessible areas. The low range 4X4 option handles inclines and obstacles with ease while the high range 2X4 option allows for pleasant cruising in open sections, capable of 80km/h at full tilt. The suspension is well sorted and plush ensuring a comfortable ride even in undulating sections. 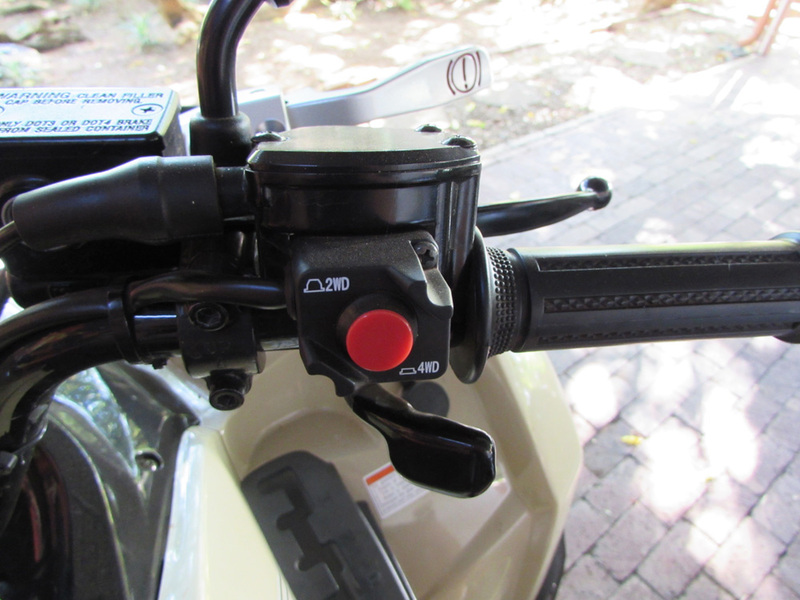 The brakes are very responsive and encourage confidence through stability, I had some very steep descents while trying to put the SYM and myself out of our comfort zone but at no stage did I feel that it would get away from me. After spending some time on the QuadRaider I could see the true value in what utility quads offer. If bakkies and other working vehicles had to be substituted for utility quads, the reduction of wear and tear on such vehicles would be significant, especially when exposed to rather rough conditions, not to mention a worthwhile saving in fuel costs. A long term test would obviously be the best way to review a vehicle of this nature but I am certain that in the limited time I had to ride the SYM Quadraider it definitely impressed. Based on its build quality, capability and very competitive pricing amongst a variety of very notable challengers, it deserves serious consideration.